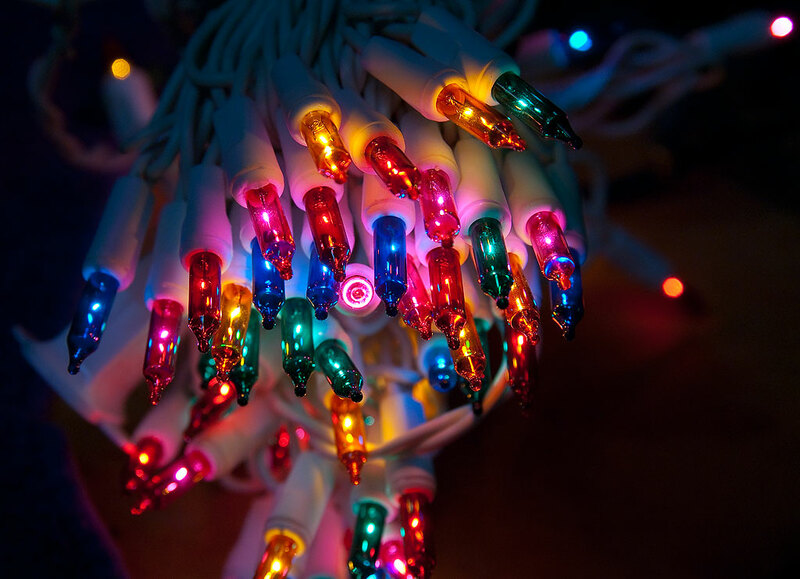 One of my chores last night was testing all of our Christmas lights. For more than a month, I have been duking it out with a ball hitch on the back of our lawn mower. The trailer/cart we have, which Abby’s father made for her, has a pin instead of a hitch, so I wanted to remove the ball from the mower. 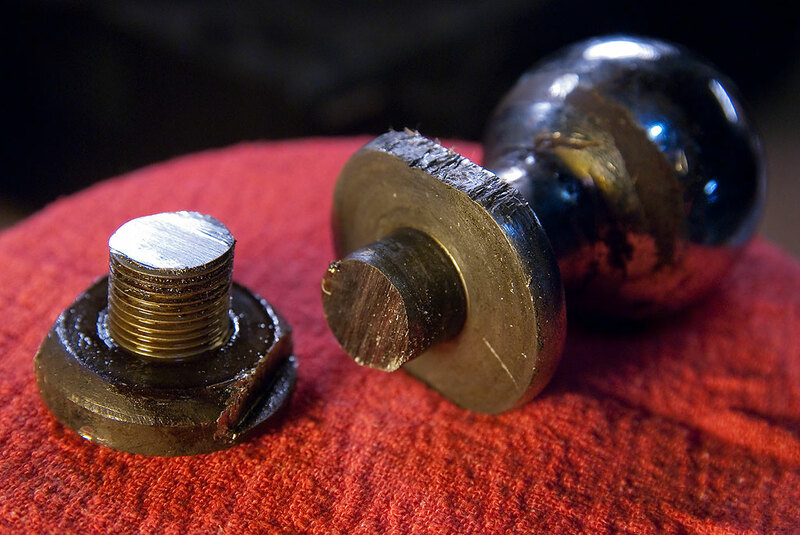 The nut holding it on unscrewed some of the way, then seized up, I guess from rust in the threads of the bolt. I tried spraying it with Rust-olium and WD-40, and when that had no effect, I immersed the whole thing in motor oil for a week, to no effect. 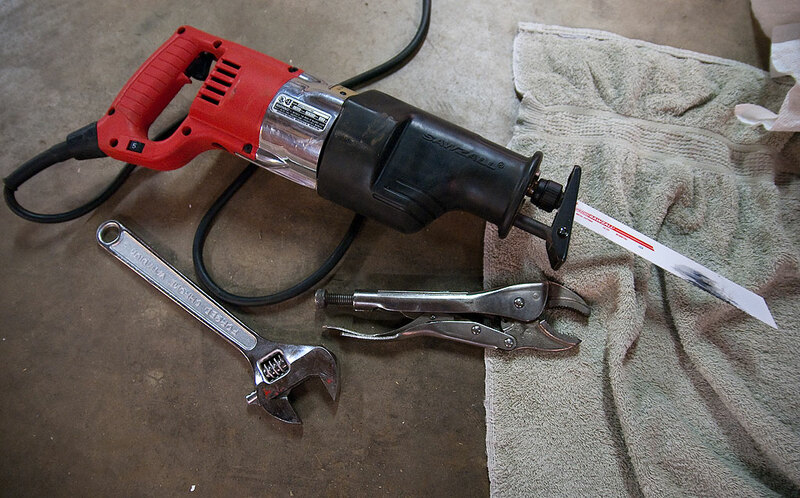 This is the Milwaukee® Sawzall that did such a good job cutting through a steel bolt. I started thinking about how I might cut it off. A handheld hacksaw would take forever, and I wasn’t sure it was even possible, since bolt hitches are probably made of case-hardened steel. Then in the midst of another project, I came across Abby’s father’s Milwaukee® Sawzall (75th anniversary edition), the kind of saw you typically use to cut into flooring. There were a number of blades with it, including a number of metal-cutting blades. It turned out that this super saw cut through the bolt in about 45 seconds. I considered it a personal victory. Not only did the Sawzall cut the bolt of the ball hitch, it did a very clean, fast job of it. 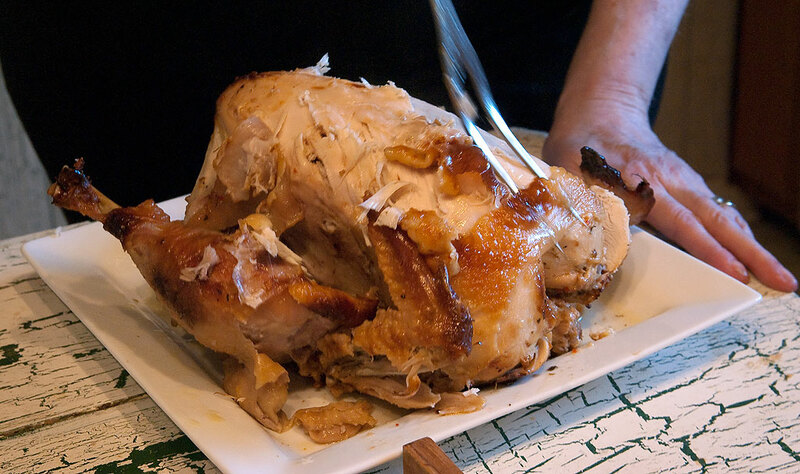 Abby carves her chicken on Thanksgiving Day. The rest of the Thanksgiving weekend was nice. In addition to my Tofurky®, Abby made a chicken for herself, and we shared some of the classics: stuffing, corn, broccoli casserole, and five thing cherry stuff, plus pumpkin and pecan pies. 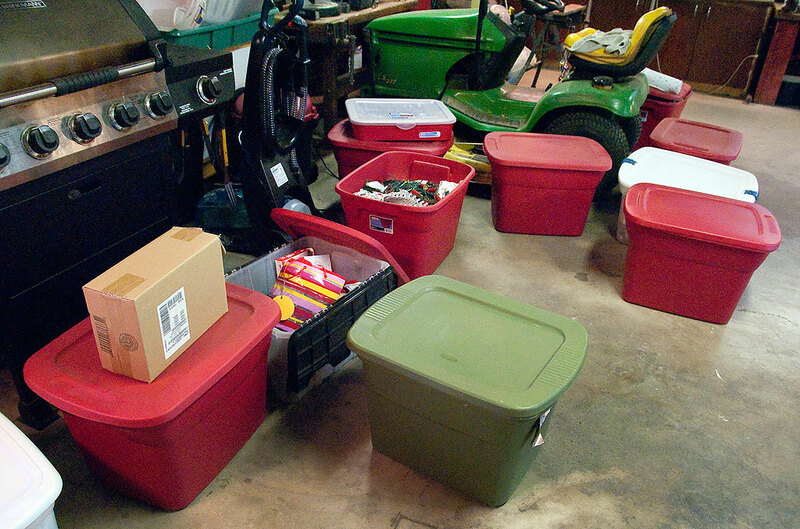 Yesterday I got the Christmas tree hauled into the house, then brought the bins of decorations down from the rafters in the car hole (garage); last year I bought a bunch of plastic bins in the holiday section at Wal Mart, so I was able to be better organized when I put everything away. I found all the lights and tested them. The bins full of Christmas decorations sit on the floor in the garage last night. Cleaning the garage in the past weeks made this chore much easier. Would you call this a boxmageddon or a boxpocalypse? The final significant drama in our home this weekend was a disastrous effort on my part to trim Sierra the Chihuahua’s nails. I’m usually pretty good at it, but for no apparent reason, I nicked the quick on a nail on every paw. I would hate to have CSI examine our house, because there is blood everywhere. 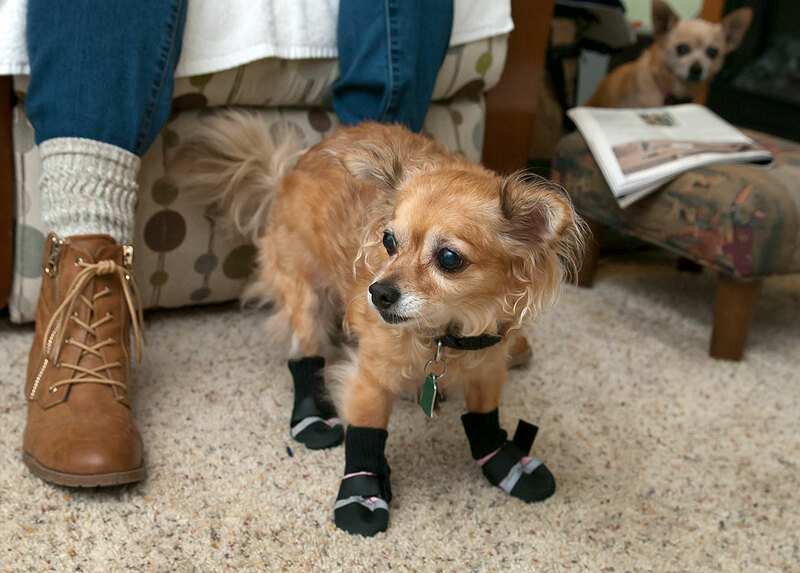 To keep the carpet from getting messed up, Abby put booties on her, which worked, but sort of freaked Sierra out. Sierra seems utterly baffled by booties on her paws, though they did keep the carpet clean.